Director of Education Rory McGuckin polls students on the needs of their school community. October 30th, 2018 – Student leaders file into the large boardroom at the CEC for CSLIT’s October General Assembly meeting. This month, speakers included TCDSB Director Rory McGuckin, and Madonna teachers Audrey Ferrer and Celia Ieradi. 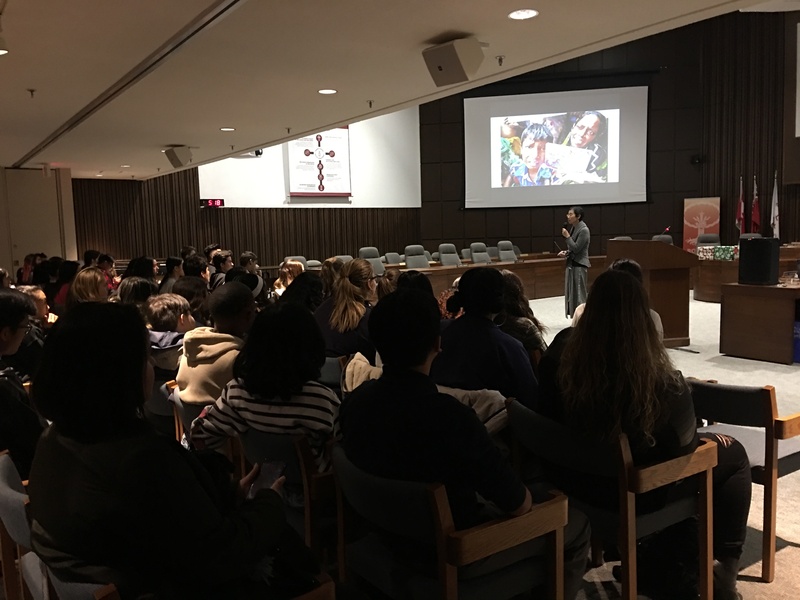 Following a prayer from CSLIT’s Faith Ambassador Gabriella Davies, TCDSB Director of Education Rory McGuckin addressed the students and highlighted the importance of student voice and involvement. Director McGuckin explained how the vision of our board is to transform the world through faith, witness, innovation, and action. 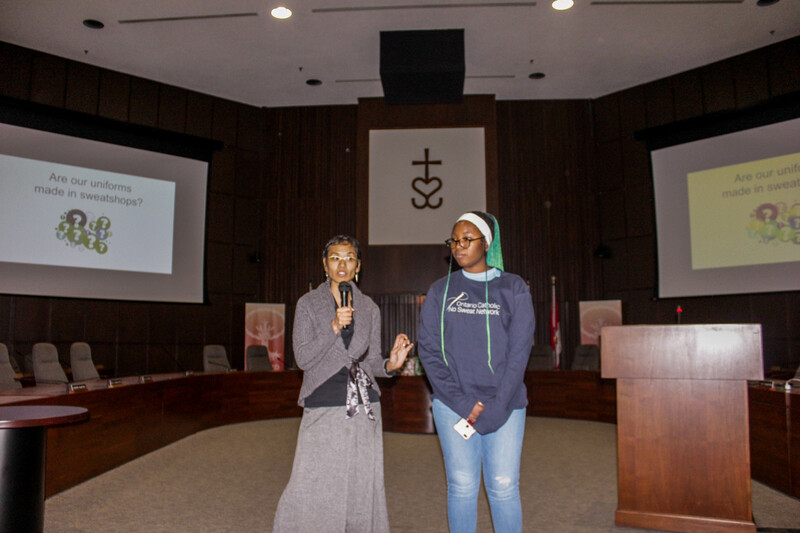 After Mr. McGuckin’s address, Ms. Audrey Ferrer and Ms. Celia Ieradi, teachers from Madonna C.S.S as well as members of the Ontario Catholic No Sweat Network gave students a presentation on the social justice issue of sweatshops. Sweatshops are a major global issue. Labourers who work in sweatshop conditions work for less than a living wage (sometimes not getting payed at all) often working long hours in very unsafe conditions. We can do our part to help by asking questions about where our clothes are made, and holding companies accountable as to where they choose to manufacture their products. Fast fashion is another issue that has serious detrimental effects on our environment. Clothes are thrown out so often that they end up sitting in landfills. Toxic dyes from clothing can seep into the ground and get into our rivers and streams. Buying and donating used clothes can help reduce the textile waste that is generated by fast fashion. After many surveys and lots of student voice, the 5 Pillars for this school year were presented to the Board by our student trustees, Joel and Taylor. CSLIT subcommittees will be tackling these issues throughout the year. If you haven’t done so already, join a subcommittee and make a difference. Feel free to contact us through our social media platforms, or talk to the CSLIT Executive in charge of the subcommittee you would like to join at the next GA! Catholic Student Leadership Sweaters are now available! They are $35 each, and all proceeds will be donated to the Angel Foundation for Learning. Order yours before November 12th and it will be ready for pickup at the next GA. If you would like to order a sweater, you can fill out the order form by clicking here. WIN A SWEATER FOR FREE!! Comment below. 1 random comment will have a chance to win 1 of 3 prizes at the next GA.
Register here if this is your first time! Follow CSLIT on Instagram and Twitter for updates! Thank you to all who make such good things happen! Your impact, much like the ripple that extends from a stone thrown into the water, will have impacts that are beyond the measurable. Thank you for all that you do and for inspiring those around you to follow in the footsteps of greatness, leadership and service. Thanks a bunch it was great! Thank you CSLIT for everything!!! Great vibe this meeting. Can’t wait to go to the next one! looked like an amazing meeting!!! CSLIT has made me the best person I can be! October’s GA WAS SO FUN, SPOOKY FIESTA WAS A SUCCESS! It was great and amazing! Spooky fiesta was lit, great job social affairs!! !